]Every time we leave our homes we travel along them, be it by foot or by public or private transport. We use them for going to work, for travelling home, going shopping or for leisure. Sometimes we pause to admire the architecture of the buildings that line them but all to frequently, we overlook the road itself. Questions of why the road is there in the first place, how it developed or why a given road follows the line that it does? Like arteries, roads provide the vital lifeblood to every country and every community. Most of our ancient roads started their life as foot tracks, wending their way normally by the easiest geographic route avoiding where possible hills, streams and rivers. With the progression of time and usage these tracks naturally widened into paths and primitive roads. Characteristically settlements began to appear along the lines of roads particularly where two or more roads intersected. The Roman Invasion of Britain brought the first proper road building programme to Britain. With strategically placed strongholds throughout the country, good connecting roads became essential, being able to bear the weight of chariots, carts and marching legions. With a road network ensuring the rapid movement of troops, it was possible for the Romans to ensure their military governance of Britain. Roman roads were built in the most direct line possible and the line of these ancient roads still exist in todays road network. After the Romans left Britain little was done to the road system for hundreds of years but the routes the Romans established between locations continued to exist. Many areas of the country languished in something of a forgotten backwater, well-off the main road system and apart from a few small settlements considered of little worthy use. One such area stretching north from the banks of the River Thames eventually became the boroughs of West Ham and East Ham before combining into the London Borough of Newham in 1965. Much of this area to the south was marshland. The northern part of this area was more firmer land but contained little except the main eastern section of the Roman road from London which divided at Stratford. One branch leading into Essex and the Roman settlement at Colchester and the other towards Norfolk and further north, the settlement at Peterborough. Until the 18th century, London remained a relatively small place consisting of the two separate cities of London and Westminster. This all changed with the advent of the Industrial Revolution when major British cities began to rapidly expand. As they grew so did the need for commerce which in turn meant the demand for more shipping and docks increased. The original London Docks were centred around the River Thames near the Tower of London. As London grew eastwards more docks appeared in the area of Millwall known as the Isle of Dogs. Ships at this time were still under sail and it was said that sailing by tacking to and fro into the wind around the congested river by Greenwich added another day to reach the Port of London. The eastern growth of London along the River Thames was held in check at the then boundaries of the counties of Middlesex and Essex by the River Lea where no bridge existed. In 1809 an Act of Parliament was passed authorising the building of a bridge across the River Lea and the construction of a new road from the bridge to Barking where there was an ancient abbey. 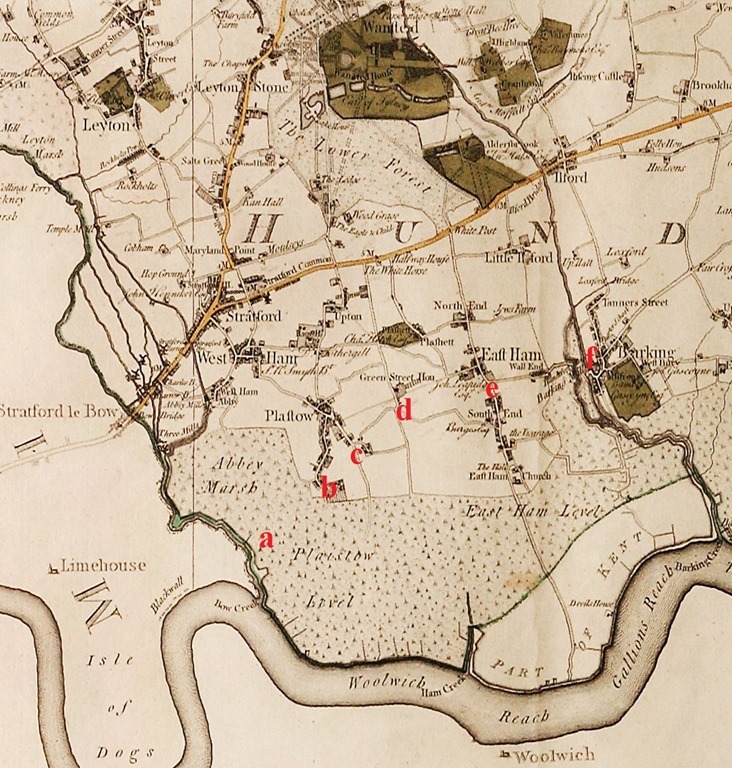 As can be seen from the 1777 map of Essex by Chapman and Andre, Point A was the location of the new bridge and the roadway to Barking was constructed avoiding as much marshland as possible. The new road to Barking, (The Barking Road), connected with what is now Balaam Street, (point B), leading from the village of Plaistow, to Greengate Street, (Point C)), also leading from Plaistow, to Green Street, (Point D), and then on to the settlement at East Ham, later became High St North, (Point E), and the North Circular Road around London, before going direct to Barking across the River Roding at Point F.
As London continued to grow, the great potential of using the new bridge and road to construct newer and larger docks on the empty land on the north bank of the River Thames quickly became apparent. There were also profits to be made from this venture by shortening by at least a day the time it took ships to sail into the heart of London to unload their goods. Industry was quick to see the potential of the new route too and shipbuilding and industrial works quickly spread and lined the north bank of the Thames which became known as Silvertown. The first of the new docks, (The Victoria), opened in 1855. This coupled with the burgeoning riverside industries created an insatiable demand for labour and in the area north of the new dock, cheap and often shoddy housing was rapidly built to accommodate the new workforce. 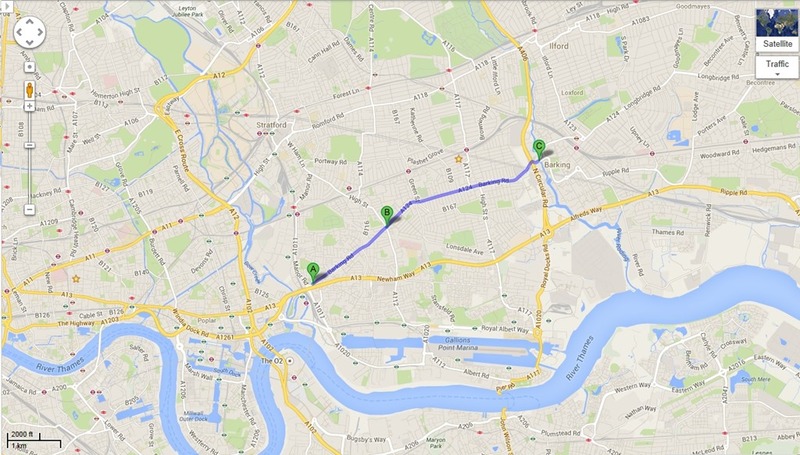 This is how the areas of Canning Town and Custom House came into existence. A new population also creates the need for shops, markets and leisure facilities. It was not long before the Barking Road originally constructed as a linking road, became a major shopping centre along most of its length and the hitherto vacant land between the old Roman Road, (Stratford High Street and Romford Road), and also south of the new Barking Road quickly became a dense housing infill. To many residents the Barking Road and surrounding areas feel as if they have always been there although in historical terms they are relatively young. The Barking Road I know particularly well as I was based for many years at a local fire station which covered most of it’s length. As for the future, the well known adage goes, “Nothing is forever”, and that is now starting to prove true for the Barking Road and its environs. Already the effects of gentrification are now being felt in the area of Canning Town with the building of high rise and high price residential apartments.Canning Town once seen as something of a deprived and run down area is now starting to be seen as a desirable living area by the Yuppie generation. Unfortunately as the process of gentrification brings new people and new money to an area, it usually has the effect of displacing existing communities through financial pressures. It feels as if an existing community with all its social history is but like a grain of sand, soon to be swamped and washed away by the incoming tide of time. Geoff Martin a long time local resident to the area has created a historical video photo montage of the Barking Road stretching back over one hundred years. It is perhaps one of the few ways of preserving the memories and history of this vibrant area. It can be seen from the modern Google street map below how even the Barking Road has been by-passed by a newer road from Canning Town Bridge leading to quicker access of the long vanished wilds of Essex. I wonder if those Parliamentarians in 1809 could have envisioned what they started when the passed the act for a new Canning Town Bridge?